Off the main tourist track in Italy’s green heart, you could say that Spoleto to coin a very overused term in travel writing is “a hidden gem.” While most people consider me a girl who knows her way around Florence, a true Tuscan traveler, the truth is I quite like escaping beyond these borders. Especially when it means I can return breathless and motivated to share new finds with you all here. Lately, the region of Umbria is one of those areas that for me, just keeps on surprising. Tiny medieval hilltop towns are ominpresent and charming while the crowds seem to stay elsewhere (not talking about the Assisi day-trippers). Spoleto was a town I haven’t yet heard of but is a perfect base for exploring the nearby towns of Todi, Assisi, Perugia, Spello, Montefalco and Orvieto. This is an area known for its rich and hearty cuisine, traditional handicrafts, and long-standing viniculture. The historical center, while steep, is easily walkable and helped by a travellator that takes you to all the town’s main sites (incredibly modern!). Its origins date back as far as 241 BC, Spoleto was later attacked by Hannibal who was apparently repulsed its inhabitants; while the town really came to form in the 6th century when one of the Dukes of Longobard made it their official residence. As far as typical Italian towns go, this place definitely has a truly elegant feel; pretty shops and restaurants serve black truffle and red wine from Montefalco can be discovered at any of the wonderful restaurants in the historical center. 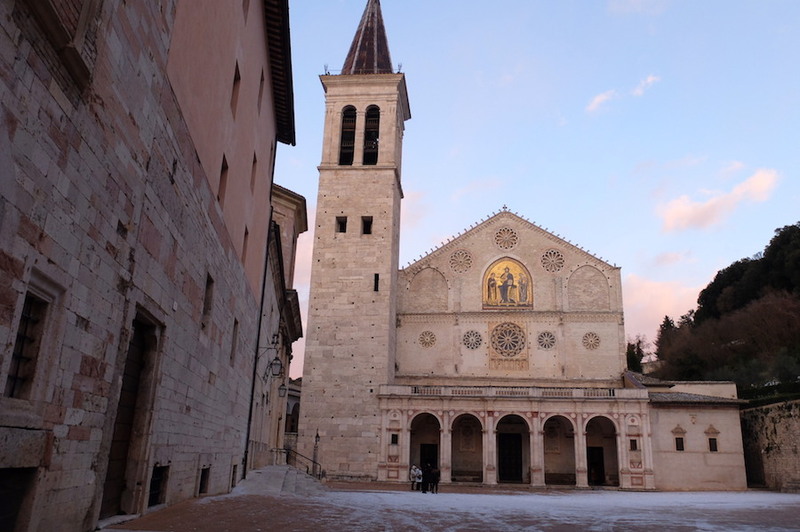 The most popular TV soap in Italy, Don Matteo, is filmed in Spoleto because it is is considered to be THE purest of all the Italian cities, not having been spoilt by tourism. 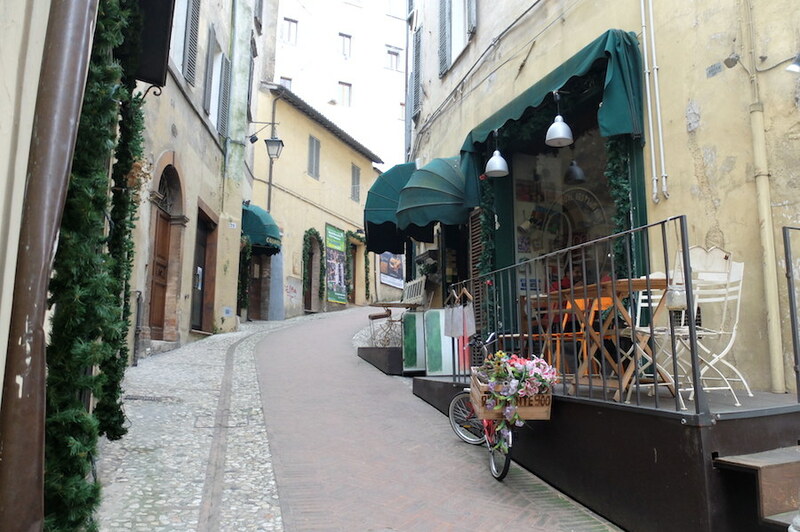 This is because Spoleto, while friendly and welcoming to tourists, has always chosen to be self-sufficient. So when the call came, Nico and I packed our dusty Fiat 500 and headed in the frigid January air to Umbria. It was surprisingly easy to reach, only a two hour and half drive from Florence and situated on the main highway. It wasn’t snowing but the air was cold and fresh, and we were happy to check in to our apartment for the weekend, owned by husband and wife team of Umbria Holiday Rentals, with whom I really got to know over the later days. “Are you sure you want to come in January?” Norma had written over email before we departed that Friday. I understood her concern, it was meant to be in the minuses the majority of days we were there, but I was game. Laurie met us in a nearby parking lot off the highway and we drove to the center, luckily their apartments typically come with parking which is a huge relief to us after accumulating more than our fair share of parking tickets in small-town Umbria. Later a friend who lives in the area reaffirmed that positive, by saying she's always gotten parking tickets in Spoleto. 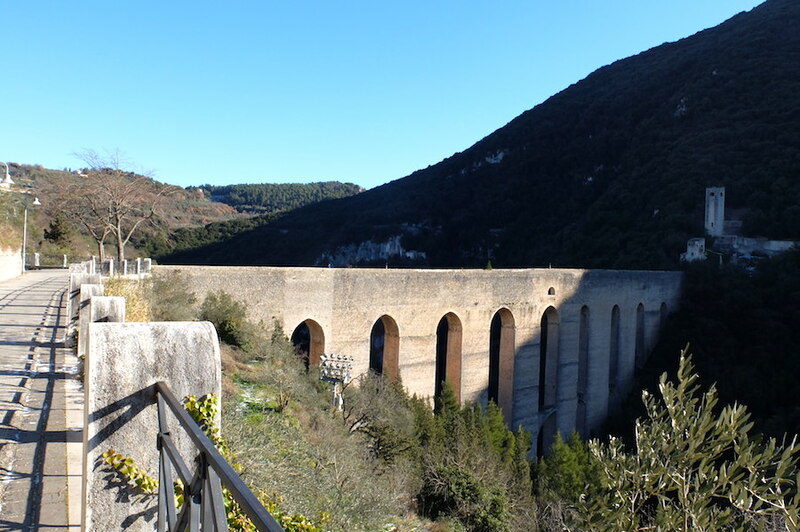 As we drove in, we passed the ancient eye-catching 80-meter-high 13th century Roman medieval aqueduct and bridge, il Ponte delle Torre, which connects the San'Elia hill with Monte Luco. The apartment itself was off one of the main walking drags, Via Porta Fuga, a pretty two-bedroom well-heated in anticipation for our arrival and full of books. 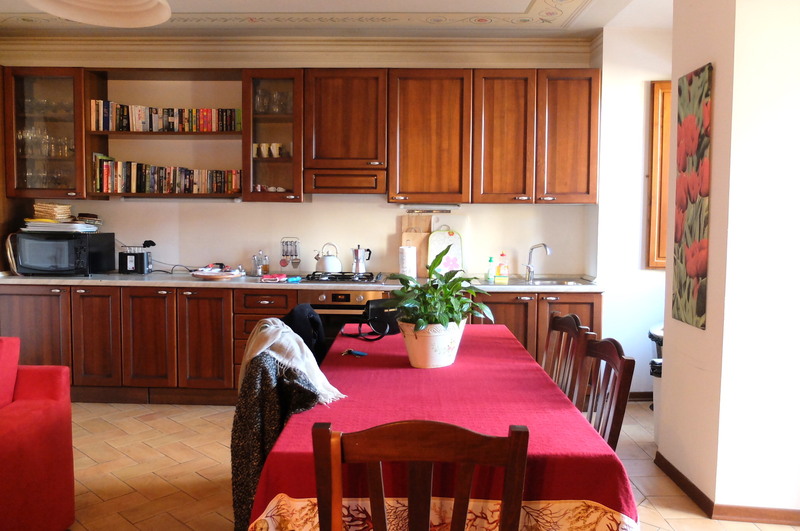 This was my dream and a wonderful example of the kind of properties you can rent through www.umbriaholidayrentals.com. It was well-outfitted with all of your basic apartment necessities, a full kitchen, coffee machine, washing machine, towels, extra blankets, working Wi-Fi, TV. As soon as I took in our surroundings, we head outside for a quick visit of the city before meeting Norma and Laurie for dinner at one of their favorite local restaurants. After warming up with coffees at a small coffee bar, we walked to the beautiful 12-13th century Duomo cathedral S. Maria Assunta, where we visited stunning frescoes by Pinturicchio and Filippo Lippi, both brightening up the winter gloom. While I didn’t get to visit the Museo Archeologico this visit, we did peek into the first century Roman theater, which was lightly dusted with snow from the night before. 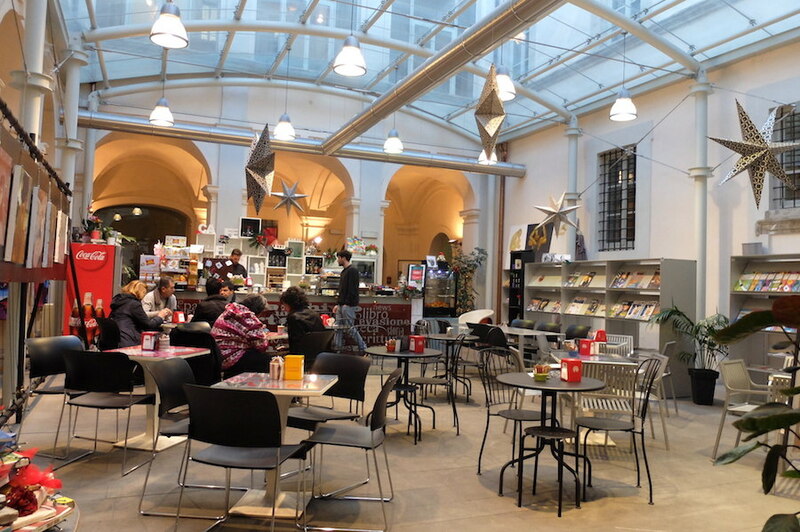 The tourist information office is located in Piazza della Libertà, here they can get you up to date on what to see and it also happens to be in the same building as a rather charming café, the Municipal Library Giosuè Carducci. Both of which are located inside Palazzo Mauri (ask to see the frescoes). Walking in 9cento casual restaurant on via Porta Fuga you are immediately struck by its quirky yet contemporary décor, serving coffee, wine, freshly-made pasta and conversation. This brainchild of Andrea Luzzi not just a restaurateur but also a poet, once again, this city never stops surprising me. 9Cento brings about a nostalgia for Andrea regarding growing up in the 90’s which you can see reflected in items like the menu which are inside books of “l’arte del Novecento.” I couldn’t help but notice that the said menu featured strange prices that include actual change, a filetto for the price of 18,85, something I’ve never seen in Italy. When I asked Andrea replied “ah yes, this from the days when we had the lire, I wanted to give people a small reminder of the past.” We dug into homemade steaming plates Umbrian strongozzi pasta (typical from the area, long and irregular, made from just flour and water – may have dubious ties with former practices of strangling priests) with black truffles from the area, followed by a tender filet with cream brandy sauce. The wine was of course affordable and heavenly; I fell in love with a bottle of Grechetto Umbrian wine from Colle Sorragani and vowed to find it in Florence. With a full belly and never-ending wine glass, we got to know our hosts a little better. A husband and wife team, both former academics in the UK, Norma and Laurie are a 24/7 live comedy duo in real life, I was completely and utterly charmed. Norma exuberant with a hearty, confident laugh, Laurie the silent but observant, throwing in witty jokes at every corner. Like a teenage girl meeting the Titanic’s Leonardo DiCaprio for the first time, her Dante reference had me at hello. When talking of her ex Norma minced no words “part of the reason I left him was I was tired of sleeping in a sleeping bag for 20 years,” all said in jest, and with a laugh. 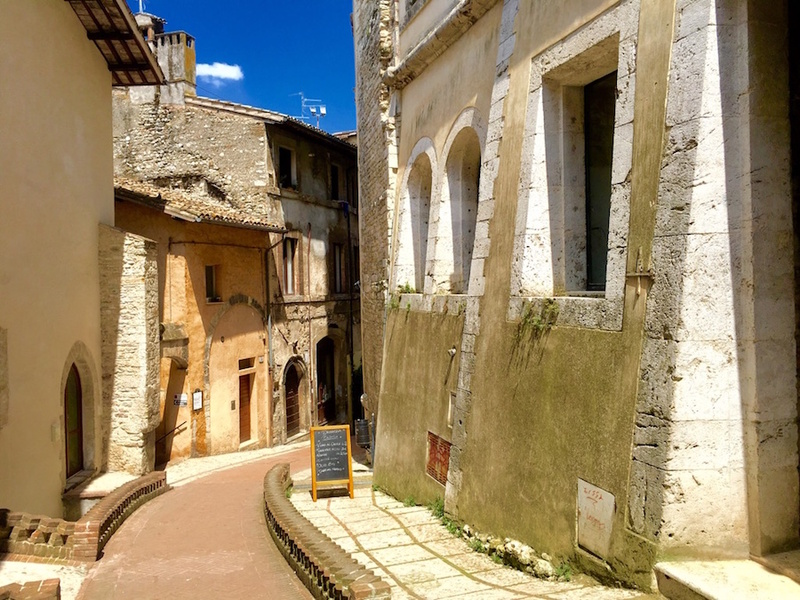 After meeting Laurie, they came back to Umbria and started their holiday rental business soon after “we made all of the mistakes in business you can make” but finally found a great business partner and Umbria Holiday Rentals was born in 2003. Not satisfied at just offering accommodation; they are also true connectors, offering experiences for their guests including truffle hunts with a local expert for a very affordable 25€ per person. It’s clear they love it here, having found their own “home” abroad, far from their native England. Something I understand very very well. Spoleto has come a long way since Norma and Laurie first got here. “It’s only been a few years that the the city has truly been open to year around tourism,” Norma explained, “it’s like the Italians wanted to keep the place all to themselves except for when the Festival dei Due Mondi was going on.” The festival of the two worlds is the most popular festival in Spoleto, with rich offerings of music, theater, dance and famous attendees in the summer months. Luckily for them, and myself included, that is no longer the case though tourism here is much less here than nearby hamlets and that’s welcomed, it’s a place for locals. This is where once comes to appreciate a slower life: perfect for those who need not rush and who are seduced, like me, by small comforts; plenty of benches and a lack of tour groups invading the town center. A dream holiday here is spent enjoying mornings drinking coffee in square chatting with friends, having lazy long three hour lunches or tasting fine wines in the surrounding countryside; the ideal town and country Italian hideaway. The rest of our time in Spoleto was as pleasant a vacation as you could dream of. Under the vibrant “Norma spell” on Saturday morning, we took the travellator up to the top where the famous Rocca lies, and the ancient aqueduct: here lies a popular walking path with beautiful views, a café lies below the Rocca where you can enjoy your cappuccino al fresco, even on a cold day in January. Keep going for an hour more and you could hike up to Monteluco where many visit the hermitage of St. Francis in the sacred wood “bosco sacra." Norma and Laurie exchange pleasantries with everyone we pass and you can tell they are well liked among their fellow locals around here, at the bar they knew that Norma took her cappuccino bollente (boiling) and Laurie's favorite croissant. Dinner our last evening was at a charming mom and pop place Ostera del Trivio, home to a cheerful bright atmosphere with checkered tablecloths and freshly made cake on a table near the kitchen. The menu offers seasonal dishes, freshly-made strongozzi with fava beans and pecorino, along with quail eggs and rabbit in wine sauce. 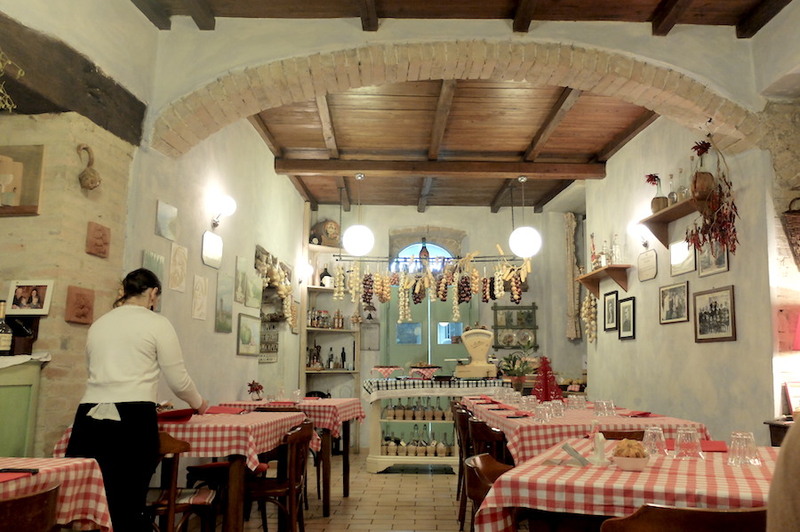 Owned by no-nonsense Umberto and his wife Mirella, they serve up simple Umbrian fare with soul. Mirella insisted we tried dessert and we didn’t dare contradict her, of course she was right, the simple local cake was the answers to my prayers. 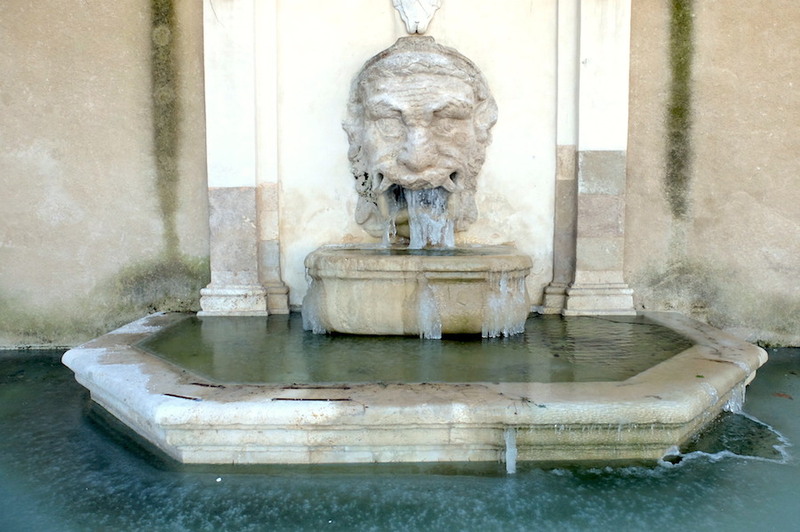 Perhaps, just perhaps, I have more of an Umbrian soul than I ever imagined, and it took a visit to Spoleto in January to figure that out. Grazie. Spoleto is most known for its historical Festival dei Due Mondi (Festival of two worlds) which takes place the last week in June and the first two weeks in July since 1958, a tribute to various art forms featuring artists from all over the world including famous names such as Pavarotti and Andy Warhol. This year will mark the 60th edition. Additional festivals include the Festival of Colors (Spoleto in Colors) at the end of April, a wine lover’s festival in the end of Spring and during harvest season the Frantoi Aperti (open olive mills) in late October/November. Make sure to check out what’s on locally in the art world as well. 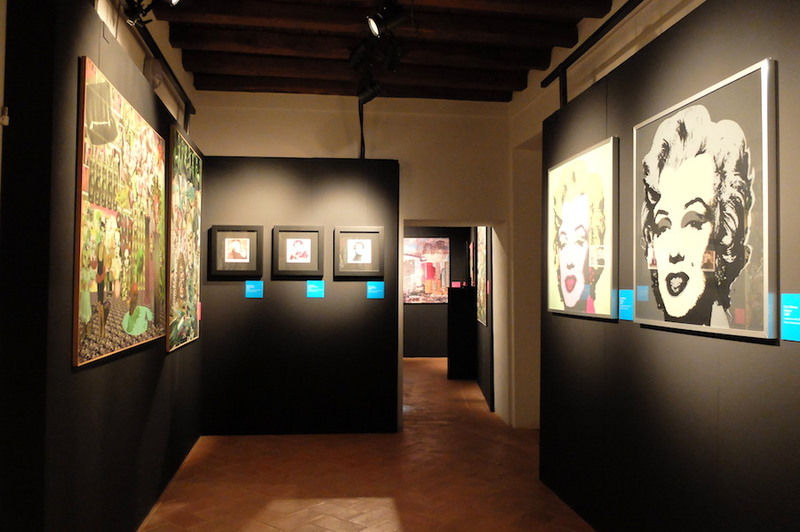 We stopped by Palazzo Bufalini where currently there is an exhibition “Warhol vs Gartel. Hyp Pop” featuring 50 works of art by the two artists, until April 2nd. The Rocca Albornoziana is one of our favorite spots in Spoleto, a defensive 15th century fortress castle with six towers built by Pope Innocent VI, from here you can check out the Ponte dei Torri and visit the Museo Nazionale del Ducato di Spoleto. 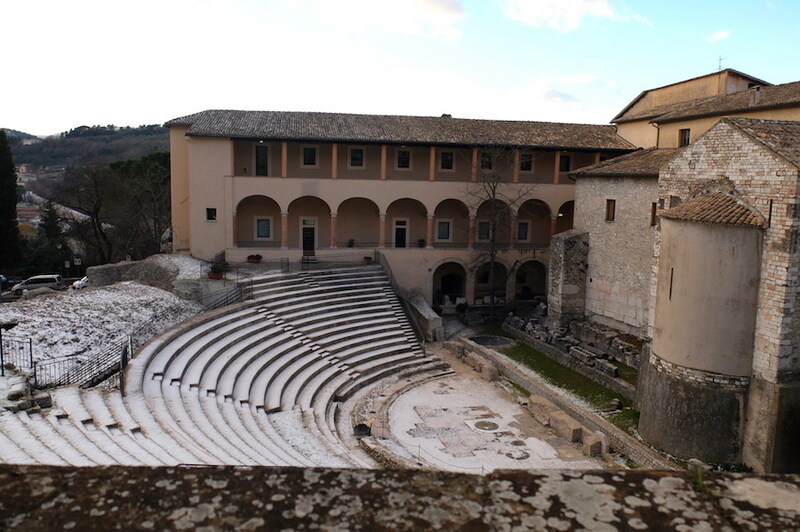 Other notable sites in Spoleto include the Archaeological museum on via di Sant’Agata 18/A and the 2nd century Roman theater (off piazza liberta), small but beautiful, its ancient stones play host to a number of outdoor concerts in the summer months. Also don’t miss the first century Roman Villa. The main cathedral, dedicated to the 12-13th century Santa Maria Assunta is home to a number of beautiful frescoes and a portico added two-hundred years later. For those who love to work out, there is an impressive gym on Via S. Pertini , Unique Fitness & Salute, in the area that is probably one of the nicest I’ve personally seen in Italy. For those on a longer stay, this would be mecca as a friendly but state-of-the-art center of fitness. Norma and Laurie of Umbria Holiday Rentals offer over 60 properties in central Spoleto and surrounding, including villas with pools. They are the largest provider of holiday rentals in the area and you would be hard pressed to find something you don’t like. On a personal note, I can assure you they are excellent hosts who go above and beyond to care for their guests, Nico and I feel like we've already become fast friends. Spoleto is very easy to reach respective of Florence (2 1/2 hours) and Rome (1 1/2 hours). 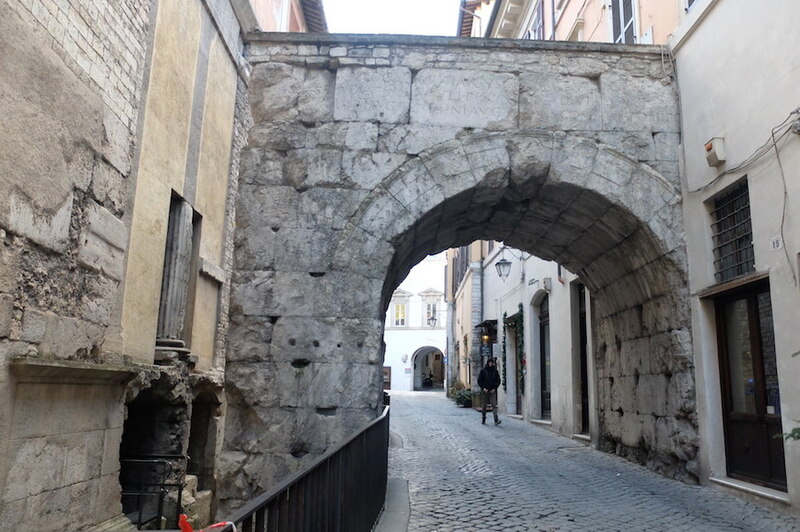 While I highly recommend a car to better explore Umbria on your own terms, you can get there by train and stay in the easily walkable center of Spoleto with any problems. Nearby towns include Assisi, Foligno, Trevi, Bevagna, Perugia, Todi, Orvieto, San Gemini, Gubbio and Lake Piediluco.